For the past several years, ECOtality has taken a lead in plug-in vehicle chargers across America, with more than 5,000 residential chargers and 2,000 commercial chargers installed to date. Of course, $115 million in Department of Energy grants that allow the San Francisco-based company to give them away almost for free hasn’t hurt. That’s the gist of ECOtality’s role in The EV Project, a public-private partnership that offers owners of the plug-in EV Nissan Leaf and the hybrid Chevy Volt a car charger that costs about $1,500 for free, along with rebates on the installation cost, in exchange for the right to collect driving and charging data. 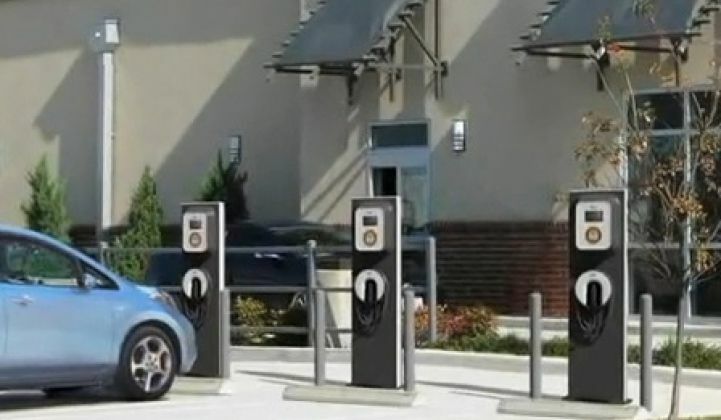 The project is also working with partners like Best Buy, Ikea, Macy's, Sears and Wal-Mart to install chargers in parking lots and make them available to the general public -- again, for free, for now. So far, ECOtality and The EV Project have hit Portland, Seattle, San Diego, Phoenix, Nashville, San Francisco, LA, Dallas, Houston and Washington, D.C. On Wednesday, ECOtality announced it's expanding the program to Atlanta, Chicago and Philadelphia. ECOtality has been hinting for years at how it might start charging for the commercial-scale rollout of its technology, post-EV Project. But now it’s preparing to roll out its pricing and access fees for real. Don Karner, president of ECOtality North America, said in an interview this week that the company will unveil its pricing and access fees sometime this summer, and has been testing them out in a Phoenix, Ariz. pilot for several weeks now. The basic idea is to establish different membership levels, and charge higher hourly prices for non-members than for members at the public stations -- say, $2 an hour for non-members versus $1 an hour for members, Karner said. As for membership fees, he didn’t discuss them. But ECOtality CEO Jonathan Read has in the past discussed anything from $5 to $30 to get signed up. This “pay for usage” model is notably different than the model chosen for the first commercial-scale car charging network launched in the United States. That’s NRG Energy’s eVgo network, which launched in Texas last year. Customers of eVgo pay a flat monthly fee of $49 to $89, which can allow access to charging stations both at home and on the road. For the higher levels of membership, customers can get free power from their home chargers -- during off-peak hours, that is. Indeed, the devil is going to be in the details when it comes to determining how car charging infrastructure players, and the energy providers that team up with them, bring their plug-in plans to market. In the meantime, charging contenders like ECOtality, Better Place, Coulomb Technologies, AeroVironment and Clipper Creek, along with the power giants like Schneider, Siemens, ABB, Eaton and General Electric with their own charging equipment, are eager to colonize future market share. Indeed, that jockeying over market position has led to a legal battle. In May, ECOtality filed a lawsuit asking a California court to block a proposed settlement between NRG and the state that would see about 200 public chargers and some 10,000 charging systems built in the state. While NRG says the $100 million investment is a fair way to discharge a $1 billion overcharging infraction committed by a company it acquired, ECOtality calls it a backdoor way to monopolize the market. As for NRG’s plans in California, the company will offer both pay-as-you-go and subscription access, with pay-as-you-go prices no more than $15 per charge during peak demand periods and $10 per charge during off-peak hours. In the meantime, ECOtality has itself been coming under attack for its use of federal funds to build out its own cross-country charging network. A congressional panel is looking into the company’s grants, and news of a Securities and Exchange Commission investigation into the company’s recent financial dealings has emerged. Republican presidential candidate Mitt Romney has attacked ECOtality’s federal funding in an ad connecting it and thin-film solar leader First Solar to Solyndra, the solar startup that went bankrupt after receiving a $535 million DOE loan guarantee. ECOtality has been around since 1989, and for much of its life has relied on government grants for its business. It went public last year and saw its share price climb to more than $6 a share, only to fall steadily since then to linger at about 50 cents per share in recent trading. ECOtality posted a $22.5 million loss in 2011 and a $16.4 million loss in 2010, but showed a $1.2 million profit in the first quarter of 2012, with an investment and technology licensing deals with ABB and news of a joint venture to deploy charging tech in China helping to buoy its prospects.